[Interview] Magician John Abrams Talks About Assembly Shows! 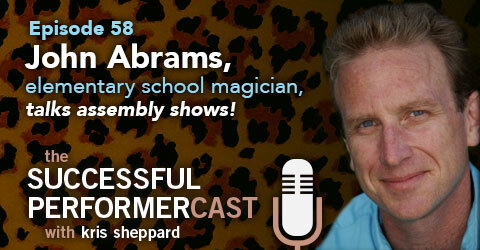 In this interview, John Abrams brings us into his business performing assembly shows at elementary schools. He doesn’t hold anything back and even gives us some example scripts designed to make his shows more effective in their intended objectives! John Abrams is a magician, actor, Emcee, husband and dad, who has found his passion, and probably also his calling in performing school assembly shows for elementary schools. Since 1998, John has performed school assembly shows, starting with his flagship show, Animal Magic, featuring all live exotic pets. He would perform that show an average of 250 times per year. Since then, he’s created countless other shows that bring inspiration and help teachers tackle topics like bullying, drugs, and the importance of good character. He currently performs over 500 shows each year at elementary schools and libraries all over Southern California. John is also an expert in marketing and has taught his methods of getting shows to other performers over the internet, through lectures, and various information products. Click Convert Profit — This episode is brought to you by Josh London’s Click Convert Profit and his book Flying Solo, the Smart Solopreneur’s Guide to Making Money Online. Click here to get $10 off and for my listeners only, the free ebook “4 Ways to Find Your Most Profitable Keywords”. • Tells how he came up with topics to create shows around. • Finding out what the teachers need, finding a pain point and building a show around that. • Tells how he researches topics. • You can look up school curriculums online at the Department of Education Website. • Go online and see what other assembly shows are doing. • Talks about his website and the elements he uses: benefit-driven headline, benefit-driven content, and market-specific testimonials. It’s basically a sales letter website. • Pricing on assembly shows: what he charges ($900 for two assemblies) and what someone breaking in should charge ($700 for two assemblies). Mentions other possible pricing structures. • How he uses Yelp to get testimonials. • Differences between assembly shows and library shows. They want different results! Hear about a physically intense sales letter that he sent out to schools that he’ll never send out again! A very successful library showcase he did while wearing a space suit and booked 60 shows from it! Letting the cooperate market go. He discovered that he didn’t want to travel and perform on weekends and nights. It was tough for him to walk away from the market and potential money. Note: These scripts are tailored to John’s performance style and character. Please use these as guidelines to write your own pitches for your shows. • The importance of marketing. • Anything you give away needs to be of value, but you also need to pitch it so they know what to do with it! • Talks about his menagerie of animals and how he handles, cares for, and travels with them. • Laminate the flyers you give out. If you do that, nobody will ever throw them away! • Shaping your career around what you want your lifestyle to be. You already have enough to shows and sell them. Just do it! CALL TO ACTION: Get John to Write a Book on Assembly Shows! If enough people email John and request him to write a book on assembly shows, he’ll do it! Where can we find John Abrams?